The online measurement of dissolved oxygen concentration and pH in shaken bioreactors paves the way for proper scale down activities from bench-top stirred-tanks to smaller scales. Adjustment of shaking speed as a function of pO2 is now possible avoiding possible oxygen limitations at high cell densities. 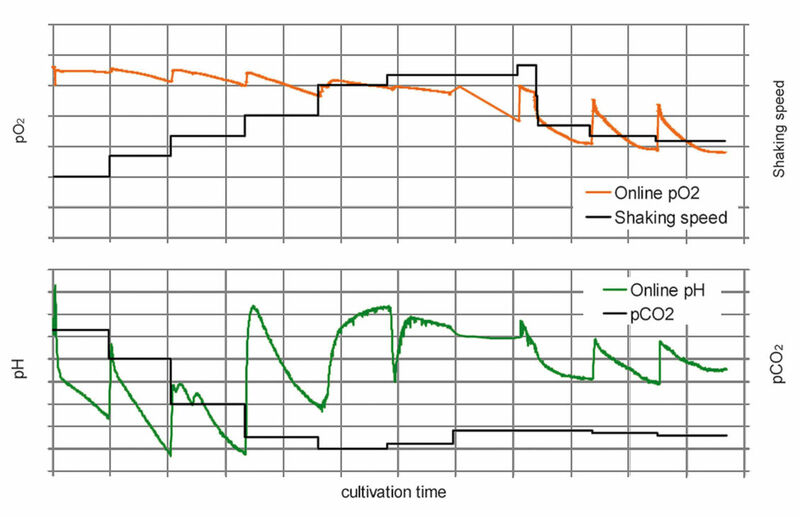 Even a simple pH readjustment by tuning the pCO2 in the incubator is feasible to optimize the output from simple experiments with shaken bioreactors. 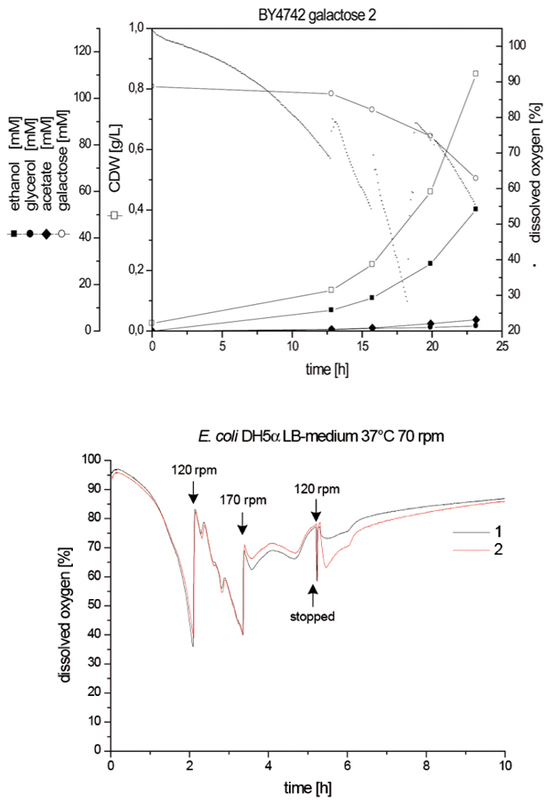 S. cerevisiae grows on different sugars as carbon source. While growth on glucose and fructose is mainly fermentative, growth on galactose is mainly respirative. This leads to low oxygen concentration in the shake flasks. The accurately measured oxygen indicates the need to increase rotation frequency to avoid oxygen limitation. 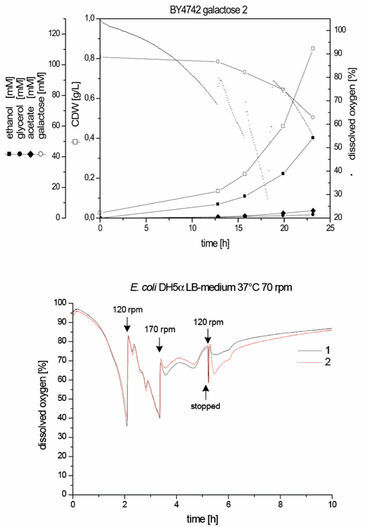 High oxygen demand is typical for E. coli in its exponential phase. 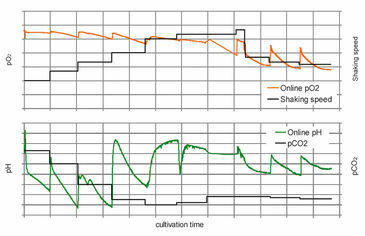 In the cultivation shown on the left, rotation speed had to be changed twice in order to avoid oxygen limitation. In addition, changes in the metabolism can be detected by measuring DO. Response time (t90)** at 25 °C: < 60 sec. Can I re-use the shake flasks with integrated sensors?How can I install the SFRS on a PC with Windows 10?How do I import data into excel from a text file containing measurement data?I am using SFR / SFR vario. What is the difference between SFS v3 and SFS v4?What is the time of delivery?Which flasks can be used with the SFR vario?Which substances can interfere with the optical O2, pH and CO2 measurements?Which types and sizes of shake flasks with integrated sensors (SFS) are offered by PreSens?Your pictures show clamps for your shake flasks SFS. Can I also work with sticky mats? Media Release: Where does the Oxygen Go?